One of our members recently took the attached photograph, showing several wagons on typical roughly-laid peat works track. 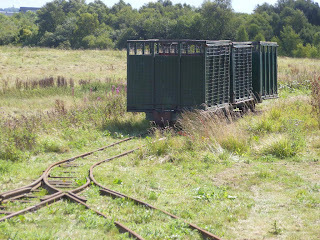 These types of temporary railways were once widespread in the UK, the peat industry often being the most haphazard, both in terms of trackwork and locomotives. Narrow gauge railways of this type continue to survive (just) to this day, primarily because peat bogs are unsuited to all but the most expensive of modern road and tracked vehicles. However, the photo is not quite what it seems. We have been busy creating the first stage of our planned “industrial demonstration railway” at Apedale. This will be used to show some of our exhibits in an environment representative of their former life. In this case the wagons are indeed from the peat industry, being some of those acquired from Midland Irish Peat earlier this year. 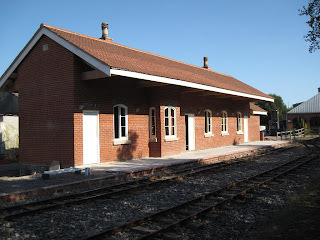 The new industrial railway will be one of the attractions to view at our Gala next weekend 10-11 September. Of course, there’ll be plenty more “made in Staffordshire” stuff to see, including our brand new station building and the debut of the restored Kerr Stuart Joffre locomotive, No 3014, together with visiting engines from Amerton and Statfold, model railways and other attractions. We are looking forward to showcasing some of our latest developments. See you there! Details here.